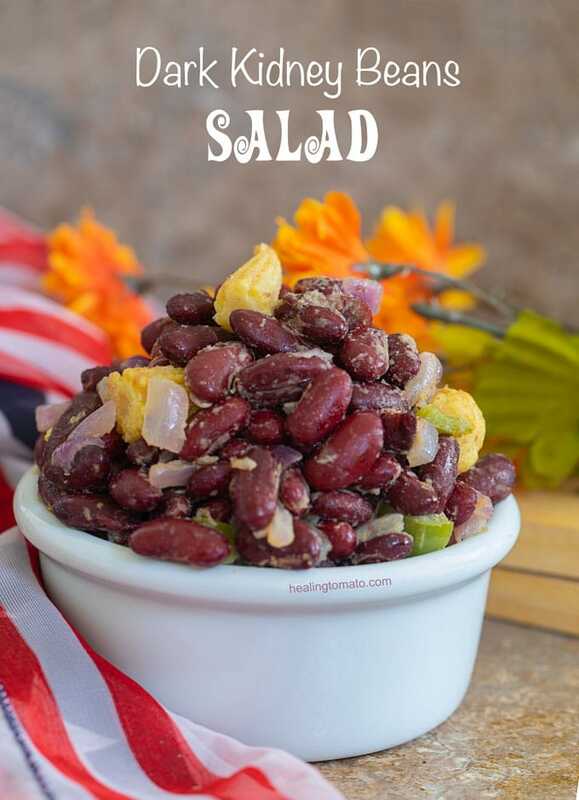 Dark Red Kidney Beans Salad is really easy to make. You only need a few ingredients to make it and its ready in under 20 minutes. Its perfect for picnics and BBQs. Use baby corn instead of regular corn because it really makes a huge difference. I am one of those people who LOOVES kidney beans! Give me dark, red, or white kidney beans any time of the day and I will devour them. Hello everyone, its Rini again from Healing Tomato and today, I have a delicious picnic recipe that you can take to BBQs, potluck or backyard parties. I made sure that its a completely effortless recipe and you don’t have to spend hours bent over the stove. I really like the flavor of dark kidney beans. It has a strong flavor and so versatile. I really like using them in a chili recipe. If you haven’t tried them in a beat chili recipe, you are seriously missing out on an amazing comfort food recipe. Dark kidney beans work great in soups and cold pasta recipes. Red kidney beans have a slight pinkish skin and work great with rice which is why they are so popular in Caribbean and Cuban recipes. 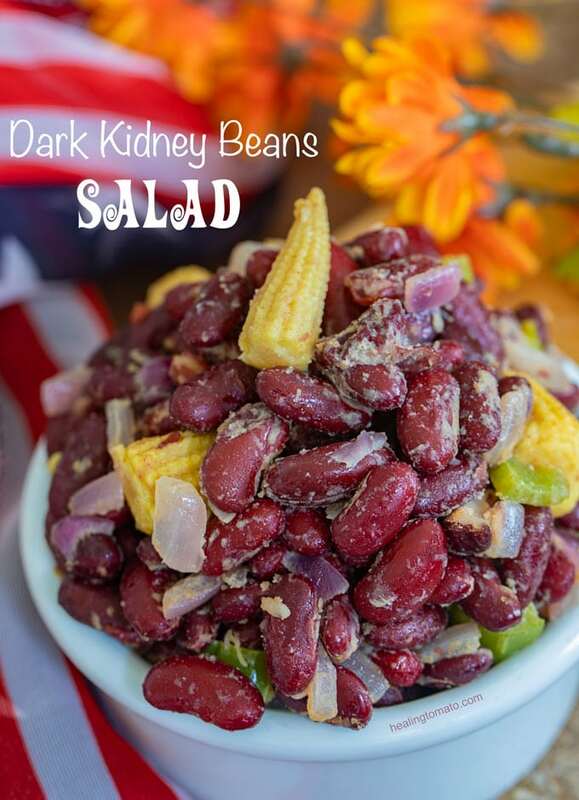 In this kidney beans salad, I used dark red variety. If you like a lighter version, go with light kidney beans. I also have a navy beans salad which is a little similar to this recipe. What is a cold pasta salad? Cold pasta salads are one of my favorite things to prepare. Its basically where one or two ingredients are cooked and the rest of the ingredients are added at the end. They are really convenient which makes them the perfect recipes for outdoor summer activities. You can add a light pasta to this recipe and skip the corn. Try it with cooked fusilli or even mini farfalles. 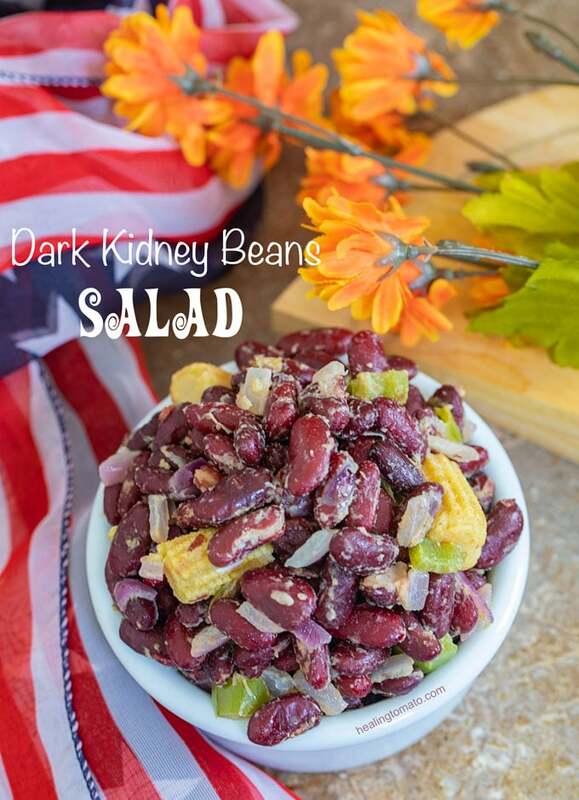 How Long Will This Kidney Beans Salad Last? 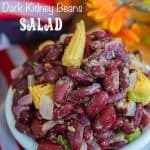 Kidney beans generally have a long shelf life which means that this salad can last a long time in the fridge. I kept if for a week and it was just as good as when it was made. I suggest you keep this salad recipe refrigerated (preferably in a glass container) for about 2-4 weeks. If you are going to use it at a later date, don’t add the liquid ingredients until you are ready to eat. This will make sure they taste fresh. Can I use corn instead of the baby corn? I highly recommend using baby corn for this recipe. The texture is a great compliment to the dark kidney beans and taste amazing with dijon mustard. If you don’t have them on hand, you can use corn kernels instead. The baby corn in this recipe is from a can, but, you can get frozen variety too. You may have to thaw it first before adding it to the oil. Can I use canned kidney beans in this recipe? Yes, I highly recommend using canned kidney beans for this recipe for one main reason. Since the main selling point is that they are really quick to make, I think canned is the best way to go. Make sure you look at the expiration date stamped on the can. I can’t tell you how many times I have bought home expired or nearly expiring cans and regretted not looking at the date. In my experience, those with about a 6 months or more expiration date are best. Freeze any unused portion of the kidney beans. After washing them, add what you need to a recipe and then place them in ziplock bags or freezer friendly containers. Freeze up to six months. To use the frozen one, I like to put them directly into soups and chili without thawing. In case you have time, make the kidney beans from scratch. Soak about 1.5 cups of dry kidney beans overnight. In the morning, add them to 5 cups of boiling water. Add salt to the water and them cook for about 60 minutes. So, what’s your favorite salad recipe to take to picnics? If you are taking it to picnic or elsewhere, wait for them to cool. Transfer to a glass bowl with a lid. Its the best way to transport them.